Daibosatsu is obviously a term of Buddhist origin, and refers to a "great kami that has awakened to the Way of the Bodhisattva." The title daibosatsu is first seen in 781, when the kami Hachiman was honored with the title Gokoku Reigen Iriki Jintsū Daibosatsu ("Great Bodhisattva of National Protection and Marvelous Spirit Power"). 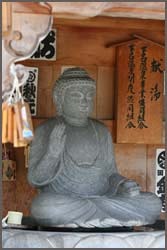 From that time, the title daibosatsu has been applied to numerous other kami, including Fuji Sengen Daibosatsu and Tado Daibosatsu. 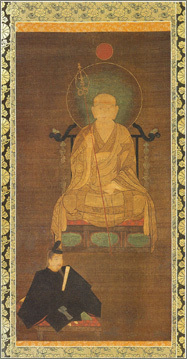 who appear in the Taizōkai Mandala and Butsugen Mandala. 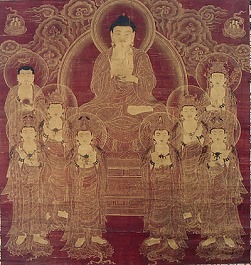 Eight Great Bodhisattva (Chn. = Bādà Púsà, Jp. 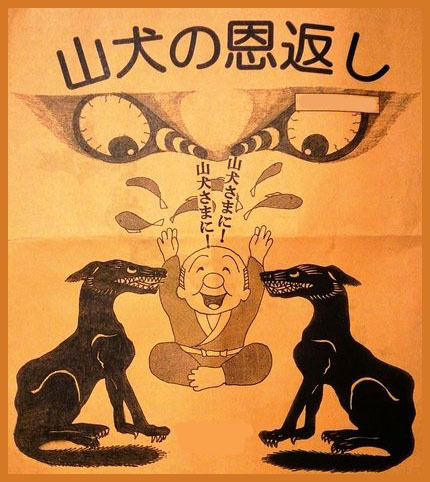 = Hachi Daibosatsu 八大菩薩 or Hachi Bosatsu 八菩薩). These eight are described in various Mahāyāna texts, wherein their names and attributes differ. The Sutra on the Maṇḍalas of the Eight Great Bodhisattva 八大菩薩曼荼羅經 (Hachi Daibosatsu Mandara Kyō), which was translated by Amoghavajra 不空金剛 in the 8th century and Faxian 法賢 in the 10th century, describes the attributes of each, including their mantra 密言 (secret words), their position in the mandala, the color of their bodies, and their mudra (hand signs). Below we present two different lists. In artwork, these deities appear in the Butsugen Mandala and in the Taizōkai (Womb World) Mandala.
. Namu Jizo Daibosatsu 南無地蔵大菩薩 .
. Sengen Daibosatsu 浅間大菩薩 . The cult of Mount Fuji 富士山　/ Mount Sengen.
. Nine Stars Crest ... 九曜紋 ... Kuyoo Mon - kushitsu 九執 . There are also human beings, saints, which received the title "Daibosatsu", some in their lifetime, some posthumously, for their efforts helping humanity.
. En-no-Gyôja 役行者 Jimpen Dai-Bosatsu, En no Gyoja . Dai-bosatsu tōge 大菩薩峠 Daibosatsu Toge "Daibosatsu Pass"
- a 1957 color Japanese film directed by Tomu Uchida. In the year 720 (養老4年) foreigners invaded Japan and many people were killed.
. Hachiman Matsuri八幡祭 Hachiman Festival .
. Myoori Daibosatsu 白山妙理大菩薩 Hakusan Myori Daibosatsu . The village headman wanted to get his married daughter back and almost killed his son-in-law. 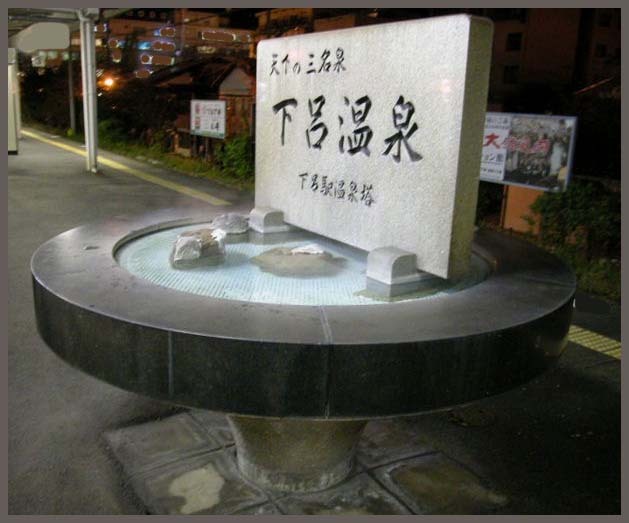 He invited him to Jagafuchi 蛇ヶ淵 "Serpent river pool", and hoped the huge serpent 大蛇 would kill him. But the son-in-law killed the serpent with a bullet dedicated to Hachiman Daibosatsu. The serpent was really huge and it took seven days and deven nights to burn its corpse. 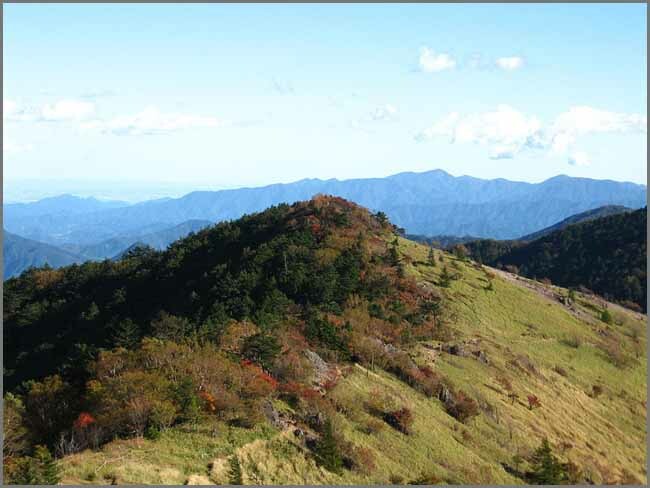 The remains of the burns are still to be seen in the ground.
. daija, orochi 大蛇 huge serpent, great snake legends . A legend told by Yanagita Kunio about a walking stick that would grow. - with more legends of this kind below.
. - tsue　杖 stick, walking stick - Wanderstab - .
. tsue 杖と伝説 Legends about the walking staff of Kobo Daishi 弘法大師空海 .
. saba no ki 鯖の木 the mackerel tree . 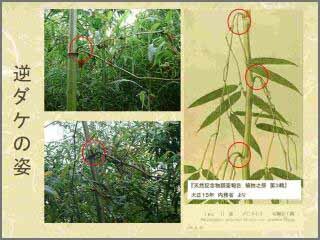 There are other legends about a growing walking stick told by Yanagida Kunio.
. take 竹 bamboo - Introduction .
. Shinran 親鸞 (173 – 1263) . 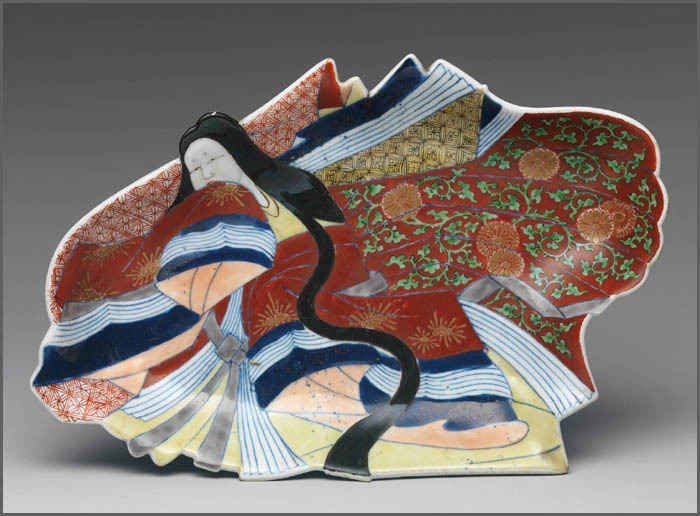 In the year 1636 when Matsudaira Naotsugu 松平新五左衛門尉直次 was in charge of the bows and arrows 弓大将, many people begun to practise the Way of the Bow. 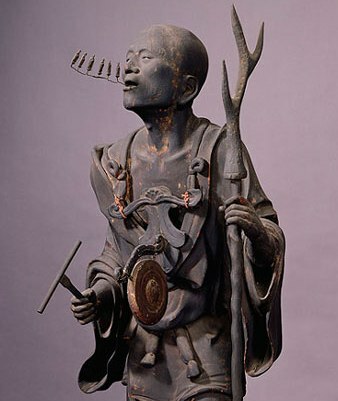 Since the protector deity of the Tokugawa clan was Hachiman Daibosatsu, this deity was also the deity of the Way of the Bow and thus many 八幡宮 Hachiman Shrines were erected with a hall to practise. 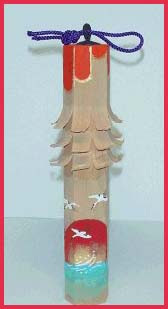 When three "mountain doves" came to sit on branches of the nearby pine tree, people knew they were doing the right thing with the right protector deity.
. Tokyo and Edo Folk Art 江戸　民芸 . 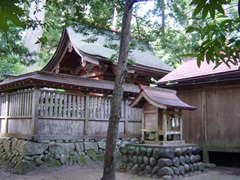 In the year 1164 a retainer of Minamoto no Yoshitomo named 大久保左馬之祐王家 Okubo Samanosuke went to Mount Mitoku san to pray for the country. 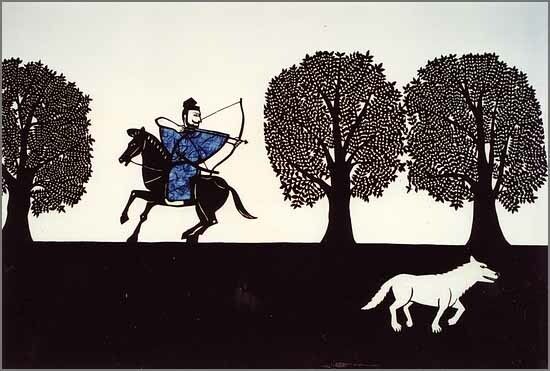 On the way he met a white wolf, messenger of Myoken San 妙見山 and helped him in distress. 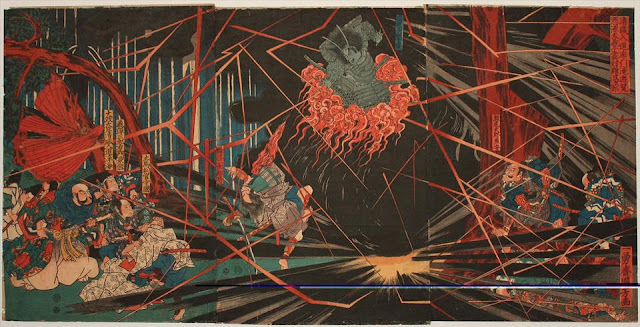 At night Myoken Daibosatsu appeared in his dream. 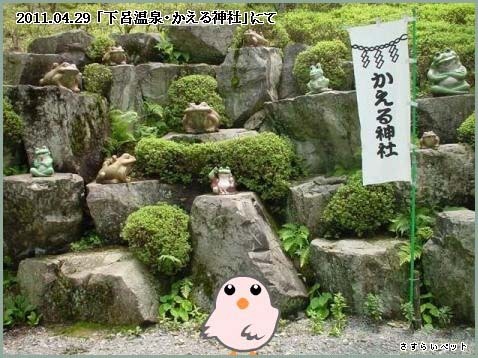 He told Okubo that there was a holy spot at the roots of the old camphor tree 老楠. 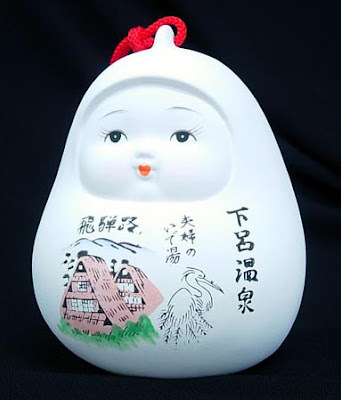 Myoken would pass this on to Okubo if he helped to save people with it.
. Mitoku San 三徳山三仏寺 and Misasa Onsen 三朝温泉 .
. ookami 狼 wolf legends - Introduction .
. Temples of Japan - ABC List .
. Temples - 都名所図会 Meisho Zue 平安城 Heian Jo .
. Aizu Go Yakushi 会津五薬師 Five Yakushi temples in Aizu - Fukushima .
. Byodo-In 平等院 "Phoenix Hall", Uji .
. Kooyasan 高野山 Koyasan - Wakayama .
. Toko-In 東光院 萩の寺 Hagi no Tera - Osaka .